日経デジタルコア : What Is Digital Core? Digital Core is a community where members can discuss and exchange opinions freely and effectively on the new society born through the use of information and communication technology. Members are composed of very experienced group of people active in various fields; and it transcends existing industrial-academic-government frameworks. 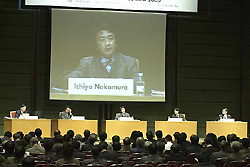 These meetings give the approximately 250 Nikkei Digital Core members the opportunity to exchange ideas and information about a variety of IT-related topics. Members also have the chance to meet face to face several times per month. These include study groups, which are held in multiple sessions on a number of topics, as well as monthly meetings where current topics and issues are discussed. Several members of Digital Core currently write columns to be posted on Nikkei Net. Intensive debate retreats are held on weekends as either all-day or overnight events. This forum commends outstanding examples of IT activities taking place throughout the country at the local level by companies, organizations and government offices. The awards ceremony is combined with symposia and debates. Breakfasts and dinners are held when experts from abroad visit Japan to create a venue for discussion and exchange. Aside from the activities listed here, Digital Core is continually making the effort to create new activities as well. Copyright 2005 Nihon Keizai Shimbun, Inc., all rights reserved.